The Frontierland Shootin’ (or Shooting, depending upon the source) Gallery opened with the gates of the Magic Kingdom in October of 1971. Over the park’s first decade the constant maintenance of the rifles, which fired metal shots, and the attraction’s targets, worn clean of paint from said metal shots, in addition to concerns over guest safety, caused WED Florida to consider alternatives. Planning began in 1982 to redesign the Frontierland Shootin’ Gallery using light sensors instead of the harmful pellets. 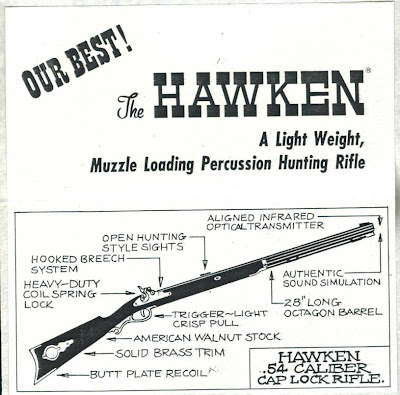 One piece of the proposal presented to park management was an advertisement for the Hawken, a .54 caliber cap lock rifle produced by the Frontierland Arms Company. When the Frontierland Shootin’ Arcade debuted on September 24, 1984, the Hawken’s place in the past of Frontierland was secured. After all, who could pass up a weapon which comes standard with a Authentic Sound Simulation? Well now I know who won *that* one on eBay... wasn't there a diagram of the revised shooting gallery included as well? Ha ha, it's good to know I was up against such esteemed competition. You're right though, there was a map as well. I had originally planned on including it as well, but unfortunately the map was just slightly bigger than my scanner, and I haven't had any luck splicing images together. As soon as I can get to a larger scanner, I will post the map for one and all.